Below are 7 tips to help you get the most out of your grill. A clean grill is a healthy grill and a healthy grill produces tasty food. ALWAYS USE PROTECTION | When you are finish using your grill, protect with a cover. If you grill outdoors this will prevent dirt build up, hardware issues, and rusting. CLEAN THE KETTLE | So the inside is sparkling right? What about the outside? Germs and bacteria on the outside of your grill can and will affect the taste of everything you cook on the inside. Make sure you clean every couple of weeks. Use no hazardous cleaning solutions or some baking soda and wipe down the outside. CLEAN WITH HEAT | Heat kills all. The same way heating your griddle then cleaning with lemon juices cleans doing the same goes for your grill grates. it does take much. When you are heating up your grill to cook, after 10 mins scrape your grates before you use. Spray some non flammable cleaning solution on the grates. COVER THE GROUND | Yes we all drop stuff when we are in the groove. Lay down some plastic or a rubber mat to make clean up around you grill easier. USE COOKING SPRAY | Like your meat sticking to the grill? No one does. Invest in some non stick spray and give your grates a coat before you put any burgers or meat on the grill. Makes sure your food doesn’t stick and makes it helps those grill marks look magnificent. DUMP OUT THE JUNK | Every forget to clean out the excess in your grill and get ash all over your meat. Probably you have. To prevent this and the disgusting flavors that come along with it, dump your ash and used charcoal after you finish grilling. Consider it part of your clean up routine. This includes the ash catcher. Once the grill is empty, clean it out with a wire brush. MAKE A PYRAMID WITH YOUR COALS | Stack your coals for the best airflow. Make a pyramid shape in the middle of the grill for maximum air flow and heat with the least amount of smoke. Like this article? Click that share button and spread the love. 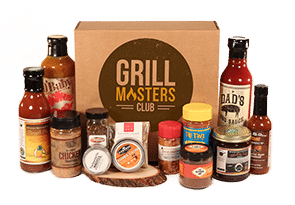 Grill Masters Club is a BBQ subscription box that sends you the best BBQ products to your door monthly.